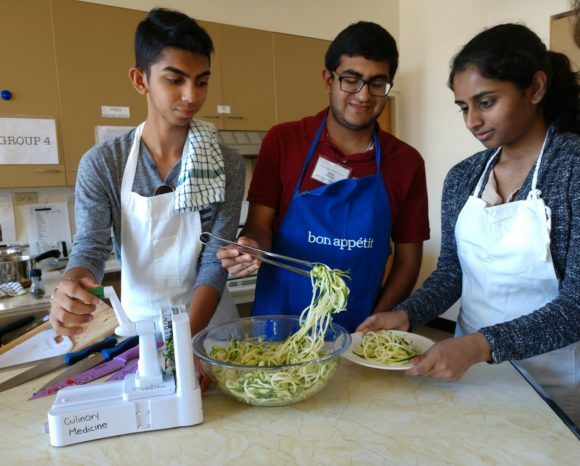 Share the post "Summer Science Scholars Get a Taste of Culinary Medicine"
Summer Science Scholars (l-r) Rohan Shah, Vivek Trivedi and Priyanka Solanky made their own zucchini noodles as part of Culinary Medicine cooking session. Each summer, a handful of rising New Jersey high school seniors interested in health care careers participate in the Rutgers Robert Wood Johnson Medical School (RWJMS) Summer Science Scholars Academy (S3A). The students engage in a “mini-medical school” experience exploring the human body through a series of lectures, organ laboratories and clinical experiences. Students are also exposed to different health care careers and various topics in public health through interactive small-group seminars. With visions of three-weeks full of labs, clinics and lectures, one thing these enterprising seniors don’t anticipate, is ending up in the kitchen. But that is just where 12 participants in this year’s S3A found themselves–cutting, chopping and sautéing–as part of the Culinary Medicine portion of the curriculum. This is the second year Culinary Medicine has been incorporated into the Academy. The program has been adapted for the S3A from the two-semester curriculum offered through the medical school in collaboration with the Department of Nutritional Sciences at Rutgers School of Environmental and Biological Sciences. Nurgul Fitzgerald (l) oversees the finishing touch to a healthful salad created by Steven Graham, Simran Buddhadev and Eliza Weininger. Nurgul Fitzgerald, associate professor and extension specialist in nutrition and public health, Department of Nutritional Sciences and Emine Ercikan Abali, professor of biochemistry and molecular biology at RWJMS are co-directors of the Culinary Medicine program. Chef Alyse Van Liew facilitates the cooking sessions, assisted by a second-year medical school student. 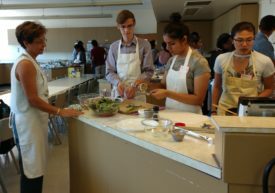 The S3A Culinary Medicine section involved a hands-on cooking lab, where the students made four different versions of spaghetti–ranging from traditional to most healthy–including a vegan option along with zucchini noodles. While dining on their culinary creations accompanied by a salad of mixed greens sprinkled with sunflower seeds, the students discussed the nutritional differences between the meals, and how it can influence disease states such as high blood pressure and heart disease. Traditionally, medical schools have offered students very little training in nutrition. This trend, however is changing. “Realizing the importance of foods and nutrition in disease prevention and wellness overall, there is a growing interest in medical schools to have more food and nutrition-related education,” said Fitzgerald. 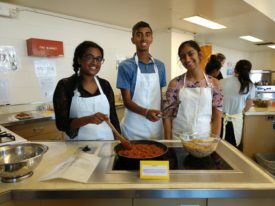 Aspiring medical professionals Sandya Subramian, Arun Movva and Riya-Aisha Patel show off their creation of a spaghetti sauce with onions, garlic, red pepper and mushrooms. Rutgers Culinary Medicine program is being delivered through a collaboration with the Goldring Center for Culinary Medicine at Tulane University School of Medicine, and Rutgers takes it a few steps further. 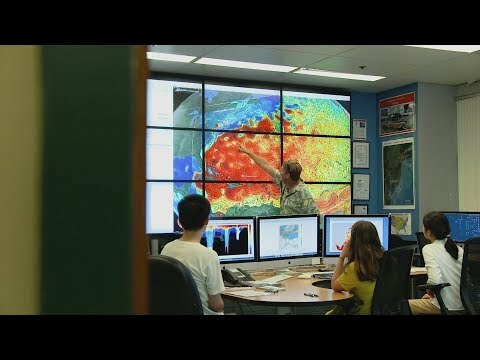 “We enrich this experience by turning it into inter-professional learning. We bring together the medical students with our senior nutrition students and even School of Arts and Sciences’ kinesiology students in our classes. Through hands-on work in small groups and additional in-depth discussions about relevant research topics, our aim is to create a richer, interactive and inter-professional learning opportunity for our students,” said Fitzgerald. Through the Culinary Medicine program, another goal for the Summer Science Scholars is to plant the seeds for learning more and growing an interest in healthful eating for themselves. Teaching hands-on cooking skills is a key to cultivating this interest, especially since some of the students had not cooked anything in the kitchen prior to the event. An informal survey at the end of the session gave positive results. When asked whether they would prepare the foods they learned that day at home, all of them raised their hands.